I had to change my powder-alert email settings from Mammoth. Everyday I would receive snow mail in my inbox from California, one foot overnight, three feet in a week, 100 inches in 10 days. Enough already! Surely you have heard that California mountains are buried in record amounts of the white stuff, topping 28-feet (while we right-coasters are still measuring in inches). Californians wrote the book on how to play, and Mammoth is their #1 winter playground. The state motto “Eureka,” is Greek for “I have found it.” Our April ski truip we found it too – snow in Mammoth proportions. We got a firsthand taste of the “foot overnight phenomenon,” followed by a day of sun and then more of the aforementioned powder – so goes the Mammoth cycle. None of the locals seemed shocked by our good fortune, or the super-sized 15-foot base depths, just another day in this winter play land apparently. 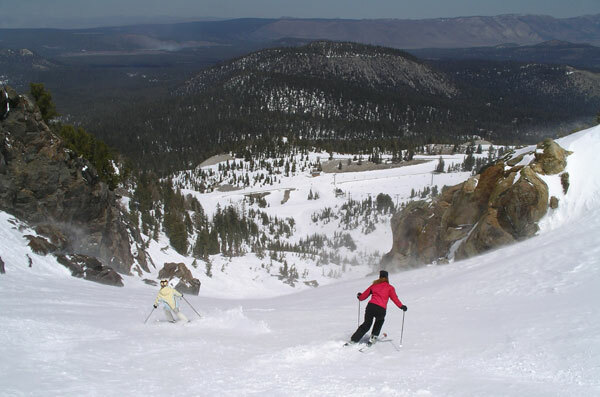 This top rated ski resort, located in the center of the “Golden State,” has one of the longest, deepest, sunniest ski seasons in the country. Multiply a 200-day ski season, with 300 days of sunshine a year, then add 400 inches of snow and you have yourself one Mammoth ski trip. Mammoth has undergone a big resort renaissance from Intrawest, same magic wand that transformed the likes of Tremblant, Copper and Whistler. 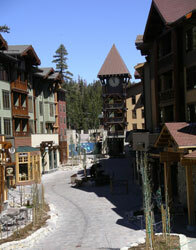 We stayed at the Village at Mammoth, in a spacious alpine-motif condo. We could walk to the handful of shops, pubs and restaurants in the pedestrian plaza. Mammoth is monstrous as its name implies, with 3,500-acres served by 28 lifts – an impressive uphill capacity nearing Whistler. In fact, you can ascend the entire 3,100’ vertical via one speedy scenic gondola to the 11,053’ summit, and ski in all directions. Mammoth should not be lumped in with the Sierras of Lake Tahoe. 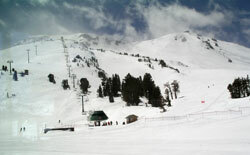 The base elevation at Mammoth is 8,000’, equivalent to Squaw Valley’s summit. Surrounded by desert (and a 3-hour haul from Reno airport), Mammoth is subject to a unique weather convergence of abundant powder, sunshine and a blow-your-hat-off High Sierra wind. The blustery tendency is both a curse and a contributor. While gondola closures can be an issue, dyed in the wool Mammoth-ites will tell you those gusts of snow blowing wind keep the slopes “buffed.” Snowdrifts fill in mogul fields and give a fresh coat of “pow” each night – sometimes even between heart thumping runs. Mammoth is ultra popular with snowboarders, it is a California thing (dude). One snow surfer told me Mammoth has “vibe” – I believe that is a good thing. The entire massive mountain rides like a giant natural terrain park with peaks, bowls, cliffs and curves. Mammoth holds its head high with the best ski resorts in the West. The above-tree line bowls of Dave’s and Scotty’s are as vast as Vail with the pitch of Snowbird. Cliff lined chutes of Hangman’s and Huevos Grandes will satisfy adrenaline seekers like the Big Couloir at Big Sky. The stunning rock formations of Dry Creek remind me of an off-piste adventure at Val D’Isere in France, and Avalanche Chutes 1-3 can hold their candles up to Alta’s steepest. Scenery is my thing, and this central Cali resort overlooks the striking Sierras and spectacular Yosemite National Park, with shimmering lakes below towering century old pines. Our kids loved the mascot, Wooly Mammoth (you get the picture). If you don’t see the furry character out and about, capture a photo with the massive bronze likeness near the Mammoth Mountain Inn. Après ski is definitively French – but easily translates in Californian. Bands play on the Mammoth’s sundecks and in the Village. 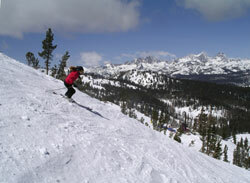 Skiers and riders don shades and shorts to hang out and soak up the lingering west coast rays. If you are looking for serious snow, Mammoth should be your California dream destination. With the entire High Sierra peak snow-coated well into May, you can make tracks at this lofty area long after Maine resorts spin their last chair. We combined our April family vacation with a kid-pleasing stopover at California Disney and a pass through Hollywood, flying in and out of L.A (with a six-hour drive to Mammoth). 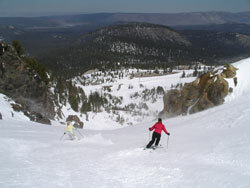 Reno is your recommended direct gateway to get to Mammoth most readily.